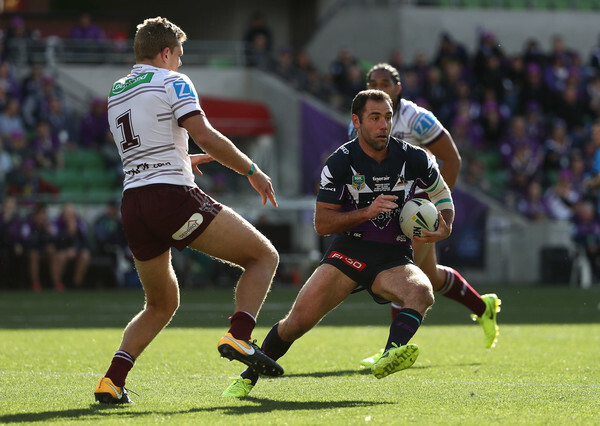 Cameron Smith almost didn’t play the Sea Eagles for his 350th game, but Melbourne fans will be glad that he did, since both the Storm and their skipper put in one of their most decisive performances of 2017 at AAMI Park on Sunday afternoon. In fact, they seem to be getting better as they move towards their finals berth, utterly decimating the visitors, who would have been left scoreless had Matthew Wright not managed to put down a solitary try half an hour in. Not surprisingly, the game played more or less as a succession of Melbourne tries, especially in the second half when the Storm’s supremacy really started to make itself felt. The first came from Jahrome Hughes sixteen minutes in, and was bookended by Smith, who floated across the field to link up with Cooper Cronk early in the set, and then managed a deft inside pass to put his fullback over the line a couple of tackles later. Before this point, Melbourne had actually been a little scrappy, with three handling errors in three sets, and Akuila Uate putting Josh Ado-Carr under all sorts of pressure under the high ball. It was impressive, then, to see Smith take control of the narrative for his milestone game, while it didn’t hurt that it was Hughes who went over, since it sent a clear signal to the Sea Eagles that he was determined to hold his own as Slater’s replacement. With a high shot on Cronk from Addin Fonua-Blake twenty-five minutes in, it was even more critical that the Storm found a way to repress the memory of Iosia Soliola’s crunching late tackle, and Hughes played a major role in resettling the team into some semblance of normality following the shock of last week’s game against the Raiders. Nevertheless, it was the Sea Eagles who scored next, with Wright putting down points off the back of a beautiful harbour bridge pass from Tom Trbojevic that sailed over Suliasi Vunivalu and Will Chambers to cement Manly’s dominance over the left wing in the early minutes of the game, even if the Storm had been stronger in general. Vunivalu, in particular, had barely laid hands to the ball, and in its elegance and simplicity the try was just what the Sea Eagles needed to regain a little bit of momentum. In fact, for the one moment in the game, it felt as if we might be in for a close clash, with Wright’s try leading to a breathtaking couple of minutes that started with the Storm regaining possession, and then a penalty, within Manly’s ten metre line. From there, it looked as if the Sea Eagles might be forced to defend right on their goal line, only for Tim Glasby to lose the Steeden right as he was crashing over, returning possession to Tom Trbojevic, who took advantage of the quick changeover to burst into open space. All of a sudden, things seemed set for a Manly resurgence, especially with Vunivalu unable to drag Wright into touch, but interference on the Melbourne winger returned the ball to Melbourne once again, only for Manly to get it back moments later. For a couple of minutes it was touch and go, but Vunivalu soon found his feet again with a second try for the Storm two minutes out from the break. 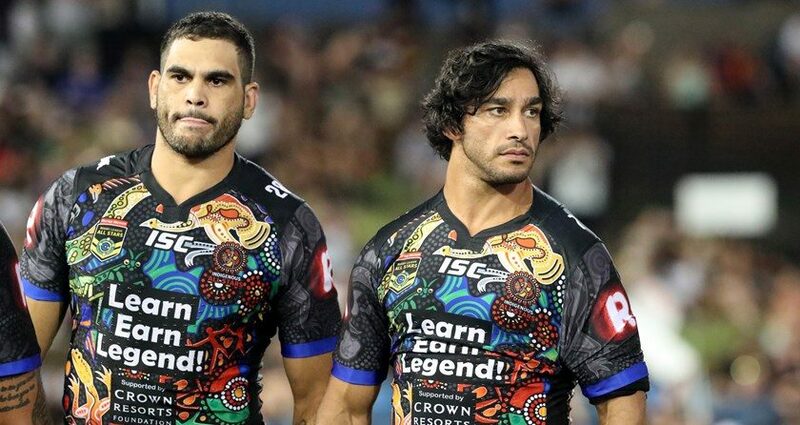 Cronk seemed to know it too, kicking over to him at the end of a plosive Storm set, with Vunivalu knocking it back to Chambers who was brought to ground moments before going over the line. Nevertheless, the no 2 saw another opportunity on the following set, plunging over out of dummy half straight after receiving the Steeden from Chambers, as if the Manly tackle that brought his centre to ground had been part of his plan all along. If Melbourne were dominant in the first stanza, then they were superhuman in the second, with Joe Stimson putting down points seven minutes it. Once again, it came off the back of some brilliant play from Smith and Cronk, who put in a nifty set piece in which Smith passed to Cronk, only for his halfback to send the ball straight back in his direction, setting up him for a quick, short flick pass to Stimson, who crashed over despite an incredible almost-trysaving tackle from Tom Trbojevic. Special mention also has to go to Felise Kaufusi, who’d set up the string of Storm sets in the first place with a terrific one-on-one strip. Ten minutes later Kenny Bromwich went over, in what was possibly the most dispiriting try of the night for the Sea Eagles. At the end of a particularly punishing set, Albert Kelly leapt up to clean up Cronk’s high ball in the in goal area, but was unable to get a hand to it, having another crack as he was brought to ground but missing out once again. From there, Blake Green dashed forwards to contain it, followed by a whole host of Manly defenders, but Bromwich got there first, managing to ground the Steeden at the very edge of the dead ball line to leave the visitors looking more dishevelled than at any point in the game so far. Incredible as it might sound, however, Melbourne were still only just over halfway through their try count, with Will Chambers setting up their final surge eleven minutes out from the end. Most of the credit has to go to a quick pass from – who else? – Smith, although special mention is also due to Hughes, who got the Storm down the Sea Eagles’ end in the first place with a blistering run and link break that saw him crashing through a handful of Manly tackles before being brought to ground twenty metres out from the line. Four minutes later, Cronk brought home the sixth try from a Smith grubber, to form a set piece that felt as if it had been devised exactly for this historic moment in the no. 9’s career. Watching it in slow motion was rugby league poetry, since it really allowed you to see just how beautifully timed Cronk’s run and grounding had been, as the halfback sped forward only to slow down at just the right moment to gently pick up the ball – the bounce was deadly – rather than relying on its own momentum to place it to earth. Even then, the Storm weren’t done, with Josh Ado-Carr bringing home the final try a minute out from the siren. Glimpsing some space up the left side, he managed to elude Uate and avoid being dragged out of the field of play, instead dancing right along the touchline to outrun DCE and then Tom Trbojevic to put down the least contested try of the afternoon. It was a decisive riposte to his hesitations under the high ball in the first half, and brought the game to a poetic conclusion by setting up Smith to convert after the siren, as a reverential silence fell over the field. While the Steeden may have ricocheted off the uprights, Smith had already stamped his signature on the game, which marked the Storm’s biggest ever victory over the Sea Eagles. From here, Manly are going to be desperate to make good on the rest of their season, while the victory may just be the final burst of momentum that Melbourne need to continue their surge through finals footy and reclaim the shield they so nearly won against the Sharks last year.